“JUST give a rap on the door!” suggested a heavily-armed policeman. I was standing outside No 10 Downing Street on Monday evening wondering whether the house at the end of the row was the chancellor’s. In the old days, when the public could wander along Downing Street, I had once been to No 10 to present a petition to save the threatened University College Hospital. But I had never been to No 11 before. Behind me, a queue of sundry courtiers and lobbyists, destined for No 10 whom I had met earlier at the security gates, were still slowly making their way along Downing Street. 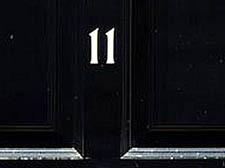 I looked up and spotted the door marked No 11. Dutifully I rapped the bronze door knocker, and the door swung open. I was early judging by the few people standing around in the near-empty chandeliered hall up­stairs. But it didn’t take long for the room to fill up. Soon, I was in a sea of chattering guests, all wedged up against each other. I had been invited by the Elfrida Rathbone Camden project, a charity in Kentish Town set up to help troubled children, for a reception where staff could mingle with guests and a few parents and children. It seems Maggie Darling, wife of the chancellor – a fan of the project – had invited staff to share her home for the evening. Mingling in the crowd was the PM’s wife Sarah, who’d popped back into her former home. Quiet, demure, how different she seemed from Cherie Blair! Chatting to a woman who described herself as an “advocate”, someone who represents parents of children expelled from school or severely handicapped children, I was bowled over by her enthusiasm. She had been a lawyer, as were most of her friends. But whereas they left their “soul” at home when they went off to the City and grubbed for money, she kept hers at work, she laughed. She could have easily been doing better-paid work, with an upward career beckoning to her. Yet she had a caseload of 80 parents, all ringing and calling her at all times of the day, often frantic with worry about their kids, and it seems she loved every minute of it. I try and be charitable. Sometimes, I give a quid or two to a Big Issue seller, help a stranger in the street with a handout. But I have to confess I felt a bit in awe of the overwhelming goodness, flowing over me with laughter and merriment from the brightly lit up face of the “advocate”. I don’t know how I’d cope with the sort of kids she likes to help or ease the pain of worried parents. I looked around in the packed hall, and at the dedicated faces, and thought maybe there’s something after all in all this charity business. Perhaps I’ve been getting too cynical about things. A young girl, small with heavy glasses but a wide smile, stood at the front and haltingly thanked everyone for finding her work experience at a local library. “I want to get a job and some qualifications one day,” she said. In the past, troubled and handicapped kids were hidden away, often in back rooms, cared for by parents marked by shame. Now, it’s all out in the open, and at last the kids with “learning difficulty” are seen as being part of the world – and isn’t that the way it should be? A woman, with a severely handicapped eight-year-old son, told me how he had just started school with the help of the project, and how marvellous it had been when she saw him pick a Lego piece and show it to another child – something he had never done before. It had started out as a fancy evening at No 11, but when I left Downing Street I felt strangely different, as if I had been in the presence of something a lot of us, unfortunately, are not used to – goodness and the act of giving. ? A NEW Shane Meadows film would normally be something of an event in British film circles. He won a Bafta for his film This is England at Monday night’s award ceremony and is regarded as one of the rising stars of British cinematography. But the selection of his 70-minute film Somers Town, to be screened at the Berlinale film festival on Saturday, has gone almost completely unnoticed. The 26-page script was conceived when Meadows visited the new Eurostar station after it moved to its new home in December. Eurostar financed the producers with £500,000 to create a cultural advert for the new enterprise. “We don’t know exactly what to do with it,” Barnaby Spurrier of Tomboy Films told me who sounded genuinely amazed of its success. Shot in pencil-grey monochrome on a 16mm camera, the film follows a young runaway who befriends a Polish boy in Somers Town. The 16-year-old orphan Tommo is played by This is England star Thornas Turgoose. Gary Nugent, one of the Eurostar directors to commission the project, said: “We first had the idea to make a 12-minute short two years ago. We didn’t want an advert. We were after something cultural.”? OLIVER Foot, who has died aged 61, led Project Orbis International, an organisation training eye doctors around the world. He is credited with saving millions in the developing world from blindness. But who did Mr Foot, who moved into his grandfather’s flat in Dolphin Square, Pimlico, turn to when his own vision began to fail? His friend Brian Little, a consultant eye surgeon at the Royal Free Hospital, now working as one of three ambassadors for Orbis UK. Mr Foot’s first love was Jamaica. He grew up in Government House there living with his father Sir Hugh Foot, the island’s British governor. Not many people know too much about Mr Foot’s acting days. But in early 1971 he founded Footsbarn Theatre Company and became its artistic director. Oliver’s uncle Michael, the former Labour leader, remembers his performances of Othello and Richard in particular. The company is still going today. FromMay 23-25, they are booked into Shakespeare’s Globe for a series of the Bard’s plays. Oliver is survived by his wife, Gail, his two children, Mary-Rachel and Jesse, and three grandchildren.? SHE’S stylishly dressed, she’s clear voiced and articulate – let me introduce you to the incredible Hetty Bower, aged 102, who held court on Monday at the reception following the funeral of our late columnist Rose Hacker. A queue formed quietly in front of Hetty, who had been a close friend of Rose’s, and a neighbour of hers at the Mary Fielding Home in Highgate. But Hetty wanted it to be known that she does not just think about the past – and she has an awful lot of it – she is already planning to petition Downing Street tomorrow (Friday) to commemorate the fifth year of the Iraq war. As the oldest anti-war marcher in March 2003, she will represent the Stop the War Coalition along with a five-year-old boy whose heavily pregnant mother also completed the march.